Even if you haven’t set foot in an art museum in years, you likely remember school field trips taken to acquaint you with the wonders of the art world. The museum was probably neatly organized, with everything displayed according to artist, time period, theme, etc. Someone took great care to make certain that your visit to the museum was a pleasant and orderly experience. Likely you never gave a thought to the work that person put in, but now Musee is your chance to become the curator of your own museum, making artwork accessible to your visitors. Think of it as going on a school field trip again, minus the smelly bus, noisy kids, and lousy sack lunches. In Musee, you are the curator of an art museum. Your job is to acquire valuable works of art and display them in an orderly fashion so that similar themes are grouped together. You aren’t just slapping paintings up on the wall, here. You want your gallery to be organized and impressive to visitors! You also want to be the first one to open your exhibitions to visitors, so you need to move quickly. Your collection will be evaluated on how many paintings you have overall, as well as on how many are grouped together according to theme. Each player sets up their personal Musee at the beginning of the game. Each Musee is divided into three galleries (horizontal rows where you will play cards) separated by the chandelier/staircase tokens, arranged into two horizontal rows of six tokens each. (This setup is for a 2-player game. There are different setup rules for 3 and 4-player games.) Begin by placing the tokens with the chandelier side face up. Once the Musee’s are set up, players now jointly agree to flip any six tokens to the staircase side. You must end up with three staircases in the top row and three in the bottom row. Each player’s Musee must show the same arrangement of chandeliers and staircases. The cards are shuffled and each player is dealt a hand of five cards. The remaining cards are placed face down on the table to form a draw pile. On your turn, you must play one card to your Musee and then draw one card to replenish your hand. Cards in the same gallery (horizontal row) must be arranged in ascending order from left to right. Numbers need not be sequential. For example, an arrangement of 2, 6, 28, 30 is acceptable. You receive bonus points for placing paintings that have matching themes (card colors) next to each other, or joined by staircases. So, for example, a Blue 2 placed next to a Blue 12 will earn bonus points. Similarly, a Blue 12 in the Upper Gallery connected by a staircase to the Blue 2 in the Middle Gallery will earn bonus points. You cannot pass your turn. If you cannot play a card, you are out of the game. Other players may continue playing. The first player to completely fill a gallery (horizontal row) receives the bonus card for that row. Each painting in the player’s Musee receives one point. Every two adjacent paintings of the same theme located in the same gallery receive a two point bonus. Every two paintings of the same theme connected by a staircase receive a three point bonus. Each gallery bonus card owned by a player receives a four point bonus. Fine Art Or Subway Graffiti? I admit to being a fan of Alf Seegert’s games. In my opinion he hasn’t churned out a clunker yet. I also like games that use art as a theme. Pastiche and Fresco are among my favorites. For those two reasons alone I was super excited to try Musee. Spoiler alert: I wasn’t disappointed. 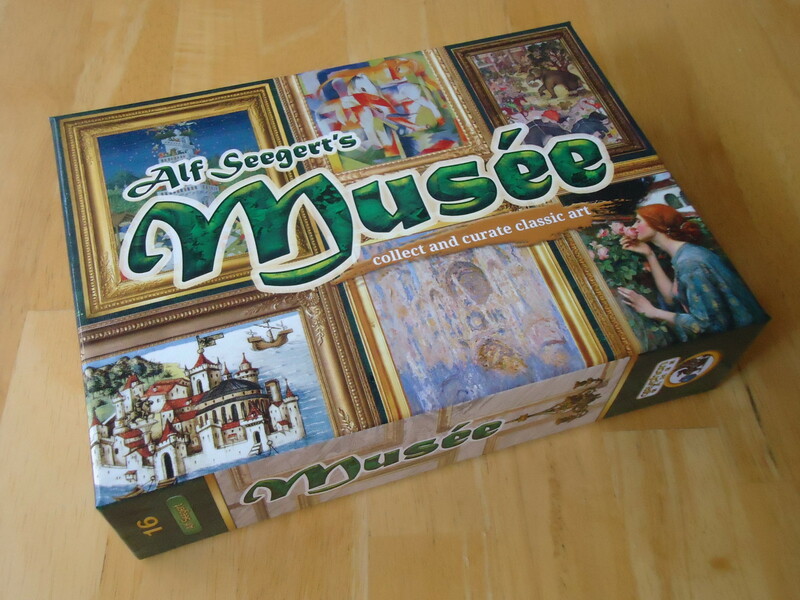 The basic rules for this game are simple: Put paintings in your Musee and try to group as many as you can together by theme for bonus points. It’s so easy to learn and explain but the more you play, the more you realize that there’s a lot more going on than just those simple rules. To begin with, you’re somewhat at the mercy of the draw. Sure, there’s luck involved here but it’s also part of the challenge. Can you make something out of potentially nothing, or can you avoid squandering a golden opportunity to score big? You may get several paintings of the same theme on your initial draw that make it very easy for you to quickly match up cards and earn bonus points. But which points to go for? Do you try to fill one gallery the fastest, or do you try to connect paintings via staircases? Do you hold some cards back in case you need them later, or just play them all as fast as you can? You could also get a lot of different themes on your initial draw and have to hope that your later draws give you something you can work with. Of course, when the great cards come along, have you left some room to slide them into a great scoring position? Since you must play a card each turn, you can quickly find your Musee filling up with “junk” and leaving you little room to rack up the bonuses later on. At least there are points to be had for having the most paintings overall. That may be the strategy that saves you in the event that placing themes doesn’t work out for you. The game also tests your spatial recognition skills a bit because it’s not enough to think horizontally. You must also think vertically and try to make use of those staircases. You don’t want to get so focused on trying to build a great horizontal gallery and grabbing that bonus card that you miss great opportunities to make connections via staircases. And sometimes you will have a card that could go in multiple places and you have to choose which will be worth more (or what might set up a great scoring opportunity later on) : Going for the gallery bonus card, connecting paintings with a staircase, or placing another painting in a gallery that’s nowhere near completion. The good news is that all information is known in this game, if you’re paying attention. Keep an eye on what your opponents are doing. Are they struggling or racking up a lot of points? Does it look like they need the same cards you do and so it’s a race to see which cards come up, or are they working on a totally different thing? If you know the deck, you can estimate what’s left later in the game. Do you have a prayer of getting that card you want or is it likely in your opponents’ hand? Watching what is out on the table, knowing what your opponents are likely collecting in their hands, and staying aware of what’s in your hand can allow you form some educated guesses about what might be left in the draw pile and what your opponent might be hoarding. It’s a lot to keep up with, but that’s what makes it fun. Focusing on just one strategy likely won’t win you the game. You have to strike a balance between filling up your Musee, going after those theme bonuses, and trying to be fast enough to grab a gallery card or two. Despite all that’s going on, the game plays very fast. A single game with two can finish in as little as fifteen minutes. (That’s why they suggest playing two out of three.) Since you can only play one card on your turn, you can only play to your Musee, and there’s no direct way for your opponent to mess with you (or vice versa), the decisions come quickly. The one drawback to Musee is the fact that it’s a bit of a table hog. The cards are oversized, which is great for the visual effect and ease of handling. It’s also nice because the cards include the artist and date of the painting, resulting in a little stealth education. 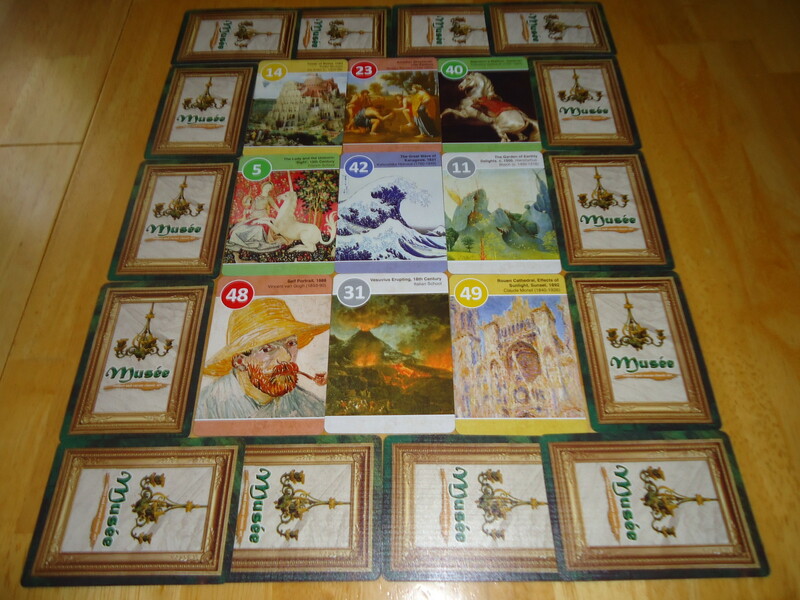 However, by the time you get them organized into three rows separated by tokens, each player’s Musee can easily take up more than half of a table. This leads to scrunching things up to try to make some room and hoping nothing falls off. If you have a big table this isn’t a problem, but this isn’t going to be a game you play on an airplane tray table or on a lap desk. Some of the gorgeous cards, front and back. We enjoyed the game most with only two players. The three player game is played with smaller Musee’s and is okay, but it goes by much quicker and doesn’t feel as fulfilling. The four player game is played in teams of two. Players sit on opposite sides of the table with no two players from the same team sitting next to each other. You cannot talk to your partner or give any hints at all as to which cards your team has in hand or which cards should be played. I found it to be a frustrating experience and wouldn’t recommend it unless you really enjoy playing games in teams. 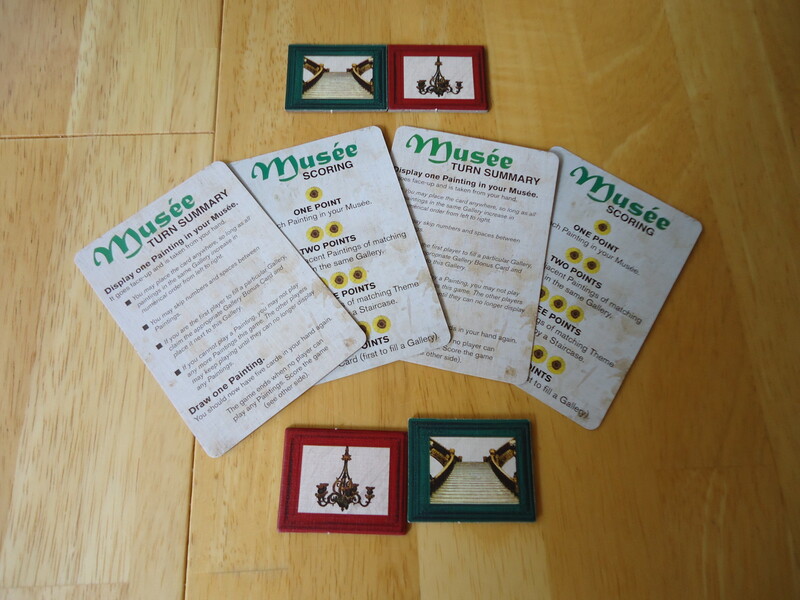 It feels like Musee was really designed as a two player game and the other player counts were add-ons. If Musee were simply, “Line up cards by color,” it would be a snore. That it’s so much more than that (and it’s beautiful to boot) makes it a fabulous game. 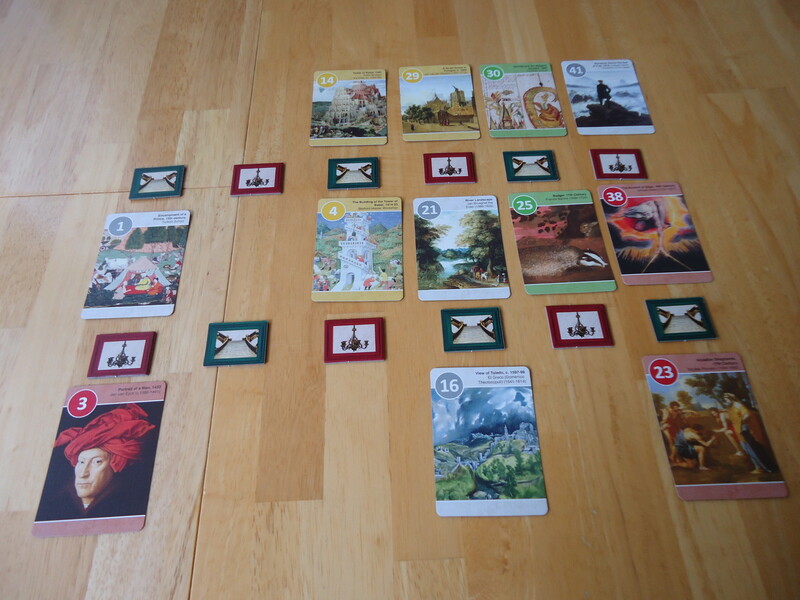 It’s a great two player card game (that also happens to play 3 or 4) that fits alongside the “canon” of other strategic, rules-light, two player (or best with two) card games like Jaipur, Lost Cities, Haggis, Battle Line, and my current obsession, Arboretum. It offers enough strategy to please gamers in a well-themed, easy to learn package that’s appealing to non-gamers, as well. A must-own for couples, families, and gamers who entertain non-gamers. Famous paintings make for gorgeous cards. 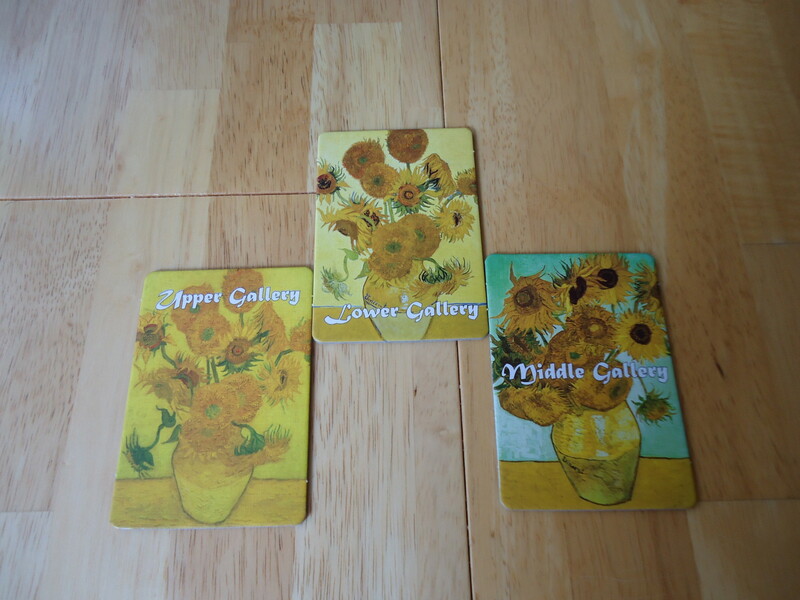 Educational value as the cards show the title, artist, and dates of the paintings. Strategic, yet light on rules. Plays and sets up quickly, making it an ideal weeknight game. Several ways to earn points and bonuses means there is much to consider when placing cards. It's a bit of a table hog.